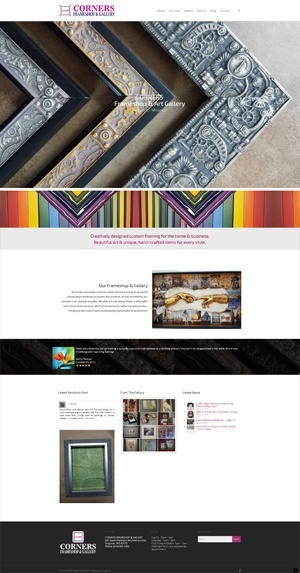 We just completed a website redesign for long time Blue’s ArtHouse customer, Corners Frameshop in Ferguson, Missouri. Corners designs creative custom picture framing and also sells unique original work by local artists in their gallery. Owner Robin Shively is a master framer. I’m not just her website developer; I’m also her customer. I’ve had many artwork pieces expertly framed by Robin and her handiwork is beautifully displayed all over my house. In 2017 Corners moved to a larger location in the historic Ferguson Citywalk area and Robin regularly holds gallery receptions and artwalk events. You should definitely contact Corners for anything you might need framed. Or just check out her gallery and do a little shopping!